The hen harrier, an iconic bird of prey, is heading towards the brink of extinction in England, new figures suggest. There are just four breeding pairs left in England and numbers are declining elsewhere in the UK. Scotland is the traditional stronghold of these raptors, but numbers have fallen 9% since 2010. 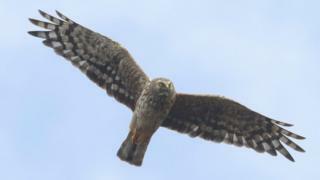 Numbers of hen harrier pairs in Wales fell by more than a third over the same period. The birds of prey live primarily on heather moorland. The males are easily identified by their black wing tips. The females look completely different, with puffy brown plumage that helps camouflage them and their nests. But this iconic species is under severe threat, according to the Royal Society for the Protection of Birds (RSPB). Illegal killings, along with destruction of their habitat, are behind the collapse of their population in England. Numbers fell from twelve pairs in 2010 to just four in 2016. Numbers of pairs in Scotland fell from 505 to 460 over the period, while in Wales they declined from 57 to 35 breeding pairs. In Northern Ireland, pairs fell from 59 recorded in 2010 to 46 in 2016. Hen harriers feed on grouse, which has brought conservationists into conflict with managers of estates involved in grouse shooting. Martin Harper, conservation director at the RSPB, said: "The latest figures back up a continued trend that we have seen for more than a decade - hen harrier numbers are on the decline throughout the UK. "The illegal killing of this bird of prey is a significant factor behind the diminishing numbers and a large barrier stopping their recovery." A spokesperson for the Department for Environment, Food and Rural Affairs (Defra) said: "We take the protection of wildlife extremely seriously and have robust measures in place to protect all wild birds, including the hen harrier. "Anyone who kills or injures a wild bird is committing an offence and could face jail if convicted." Historically, hen harriers were once much more widespread before being driven to extinction in mainland Britain during the 19th Century. Despite a subsequent comeback, the species has remained rare - and therefore vulnerable - in the UK, with a breeding population under 1,000 pairs. Longer term figures highlight the dramatic decline in the UK hen harrier population over the past 12 years. The national survey in 2004 pointed to an estimated 749 pairs, meaning hen harrier numbers have fallen by 204 pairs (39%) in the succeeding years. Mr Harper added: "Without purposeful action from all, including governments across the UK and the shooting industry, we may see hen harriers once again lost from more parts of the country."